A new archaeological find in Turkey may have just answered a question about our ancestors that has persisted for thousands of years. Ancient farming may look a little less like what we imagined it as, and a little more like what we see today. A paper from Stockholm University coming out in Current Biology on January 25th shares some new genetic analysis results from a dig of some Neolithic remains in the Anatolia region. Researchers compared their new sequences with not only several ancient samples dating back between 5,000-2,000 years old, but also modern genetic relatives from around the world today. To their surprise, there was significant overlap not just in ancient Europe and parts of Asia, but in modern ancestors as well. What does this all have to do with the origin of farming? 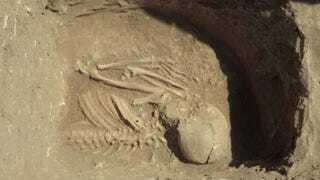 The remains archeologists have been digging up are approximately 6,700 years old. But other evidence of farming has been found that is far, far older by tens of thousands of years. And even if there is a genetic link between these remains in Anatolia and other areas of Europe, does that really tell us much? It does, but the link is a little messier than it may first seem. Deal with it, paleo dieters—this 30,000-year-old cave was once a bakery. Anatolia is one of a few ancient sites that have a potential claim to the title of the “Birthplace of Modern Farming,” having stockpiled a mass of archeological evidence. Further evidence also shows similar techniques beginning to spread outwards towards Europe. What’s not clear is how it was spreading. Was it the result of large-scale migrations? Just a few visitors or migrants spreading the word? Or perhaps it was even developing independently? This latest find paints a picture of an ancient world that was in fairly continuous and widespread contact with each other. Not only were large groups of people moving outwards, it seems that they were coming back, too. Of course, there is a note of caution to strike in all this. The samples researchers analyzed are old and therefore pretty degraded. That means that the process to get usable samples involved lots of slow, pain-staking efforts (“a ridiculous amount of work,” according to Gotherstrom) that frankly could have affected the quality of the overall results. Still, the strong implication is that ancient farming was the result of much more geographic collaboration than we believed. Just like today, farmers were in frequent contact with each other—and that contact likely resulted in passing along updated techniques and ideas, or perhaps even trade of plant stock and seed itself.